Much has happened since the renovation of Pacific Place. Not only does the design from Thomas Heatherwick changed the overall mall interior into an organic design with curves and irregular patterns, his design also extends to the top off the podium level. The interesting layout of the gardens with well-cut stones and tiles on floors and planters turn the entire podium level into a wonderful outdoor space for group activities. Here you can find one cafe and two restaurants, and today we are going to one of them, Domani (which means tomorrow in Italian). 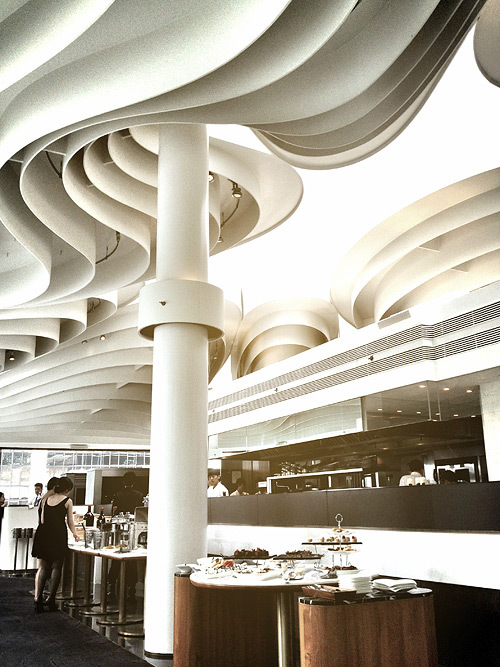 Also designed by Heatherwick, the restaurant features a swirling ceiling constructed by continuous steel plates. Completely transparent between the gaps, the dining place has plenty of sunlight penetrating to the inside during daytime, while the restaurant emits its light at night, making it like a jewel on the terrace. Talking back about the food, we only had lunch this time. We had a semi-buffet lunch which included an antipasto buffet and one main course. The quality of food was above average, and the appetizers were all well done. While we liked the food, we did not share the same feeling with the prices. Everything was exorbiantly expensive here, as we paid over HK0 (about US) per head for the lunch. Unless the food is extremely wowing, we do not think that such price tag is reasonable. Perhaps it may not be legitimate enough to judge the food quality based on just the lunch, but you may refer to the Timeout Magazine review for their dinner. I guess the reporter Alan Wong shared a similar view on the high-price-but-small-portion dishes. He is right, "In sum, if this is the world of tomorrow, then we’re quite content to live in the past."